TEMX-C 1501 has 15 needles, one head, 1200 spm, compact, sleep mode, LCD panel, USB port, thread break detection. Tajima TEMX-C 1501 15-Needle Single Head High Performance Embroidery Machine. The Tajima TEMX-C combines new and powerful functions proven in Tajima multi-head machines into a compact body. This compact machine is the same size as the NEO-II. 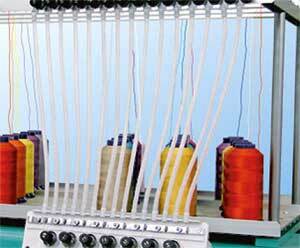 It is small but capable of making embroidery on a wide field with high performance. This machine provides powerful assistance on every imaginable stage from shop business to small lot production. Tajima TEMX-C 1501 Key Features. 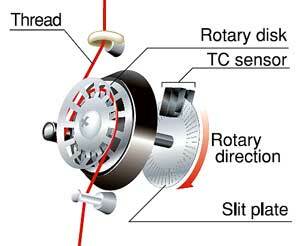 A new electronic sensor monitors thread movement at all times. 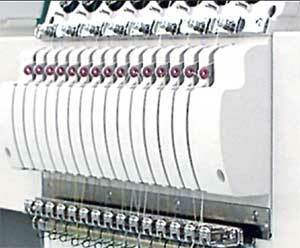 If the upper or lower thread is broken, it is detected in an instant and stops stitching to prevent production from continuing with broken thread. Sensitivity of the sensor is adjustable on the operation panel. The thread take-up spring picks up excess thread and stabilizes the balance of upper and lower threads at high speed and improves thread tension. Thread breakage due to extra-fine satin stitches (2mm or less), needle tip or thread untwisting, etc. has been reduced 30% - 50% compared to conventional designs. Productivity has been drastically improved. Spiral Tube, Take Up Lever Guard. Spiral tubes between the upper thread course stand and individual tension base protect the upper threads from environmental wind, a breeze caused by an air conditioner, etc. that would cause thread tangling. In addition, specially developed covers are mounted over the take-up levers to prevent threads from being tangled during high speed operation and to improve safety in the work area. Both the design start position and sewing condition data that is set up in the machine can be output to external memory such as USB. It is easy to recall the data without any setup requirement at the time of reprocessing. 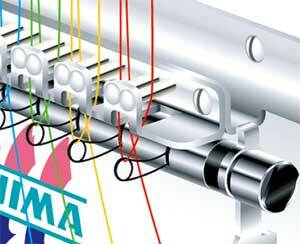 Tajima Binary Format has been introduced to support more complex and sophisticated embroidery designs. The telescopic thread stand makes the TEMX-C even more compact. This machine can be easily transported in a car. An easy to view color LCD display with special use keys along with a straight forward interface allows for improved operation. The current job is displayed on the screen in real time. Selectable Data Input / Output. Design data can be input and output using USB memory. An optional floppy disk drive is also available for data storage. The energy saving sleep mode has been implemented into the operation panel. Holding down the sleep mode keyputs the machine into sleep mode. Pressing the button again cancels sleep mode. Unnecessary power consumption can be reduced without turning off the main power. Tajima TEMX-C 1501 Available Frames. Suitable for embroidery on tubular products such as T-shirts, sweatshirts, or uniforms. Select from many sizes to fit the product. Use the wide cap frame for embroidery on finished caps. No matter which type of cap is used, embroidery to a maximum length of 360mm on an adult size cap. Attach or detach caps with an easy one-touch oepration. Three sizes available: Adult, Child, and Baby. From fabric to finished goods, embroider a wide variety of goods without changing frames. A special embroidery frame for cylindrically shaped products such as golf head cover or wine bottle covers. Choose from a clip type or clamp type depending on the available embroidery space. Designed for standard embroidery with patches and appliqué. When using a border frame a special table is necessary. Used to apply embroidery to small pockets. This frame is available in two sizes. Design Scale Up/Down: 50% - 100% in units of 1%. Rotate Design: In units of 1°. Auto Design Repeat: X/Y 99 times each. Edit Design: Stitch by stitch. Frame Back/Forward: In units of 1, 3, 5 stitches, color change, designated stitch count. Return To Start Position: Move the frame back to the design start position. Automatic Offset: Move the frame automatically to a position that is easy for changing appliqué or frames at the end of embroidery. Manual Offset: Return the frame to where it was in case it was moved manually while embroidery operation was stopped. Automatic Design Rotation On Cap Frame. A data set design is automatically rotatable on a Cap frame by 180 degrees. Ternary scale : 0.1 - 12.1mm. Binary scale : 0.1 - 12.7mm. Single-phase 100 - 120V, 200 - 240V. 50 Hz / 60 Hz.